Later, winter! So over you, it's not even funny. Spring is here, officially, but the weather is still unpredictable. It snows one day, the next its literally sunshine and daisies. I'm not complaining, I'll take any sunshine I can get! One struggle I always have during this transition stage is knowing what to wear on my feet. I'm so done with boots by now, but it is still cold and wet! 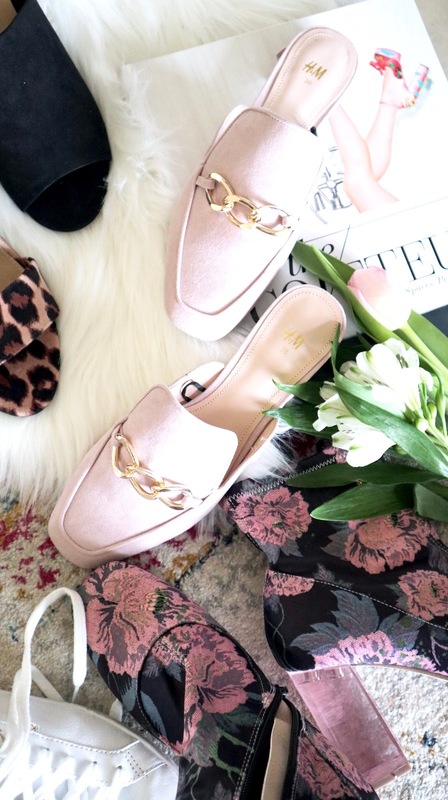 In light of the seasonal changes, I've rounded up the top shoes you need to go from winter to spring. I have been addicted to the slip-on lately. They are the perfect shoe to walk you into warmer weather. Slip-ons leave you some breathing room in the back and the closed-toe option is perfect for these March days. It still is cold, but I can't be bothered to wear boots, and they protect my toes from literally getting frostbite. Want even more springy vibes? Opt for a while pair. Beyond chic. And you can never go wrong with a pointy toe to dress up with a pair of trousers or down with a pair of jeans. These are going to become such an office staple during the warmer months, but I've already started wearing them! If there is one pair of shoe everyone needs in their collection, it's a white sneaker. When the weather is cold but sunny I love pairing white sneakers with some denim and a long wool coat. It's such a refreshing switch up from wearing boots. In the warmer months, pair them with dresses and skirts for a sporty but classic look. My Keds are one of the best pairs of shoes I own-- they withstand all seasons. I always take them with me while traveling because they are a go anywhere shoe! Remember how I mentioned snow is still continuing to fall? I just know we're bound to have another snowfall soon! So no, we can't just dismiss the realistic necessity of boots just yet. I have a funky pair to help me get through these final dreary winter days. The print screams spring, but the practicability is there. Actually, now that I am looking at these ones again, they are so impractical! LOL-- a high lucite heeled bootie? Oh well. There are so many fun options for printed boots these days, it's not hard to find a pair you'll love. Better than basic black and you can mix and match your spring patterns. The mule is not going anywhere, guys! And why should they! They are so versatile and so functional. You just slide 'em on. I bought a few pairs this season already. One flat pink pair, and also a black block heeled style. I just love shoes with no backs! This may be too much info-- but sometimes it can get hot and my feet swell! Especially while walking in the warm weather. I know I'm not the only one! Going backless is the best way to let 'em breathe but still look stylish. Sidewalk ready at any time, and they pair with any outfit-- jeans, skirts, dresses. I'm sold. Are there any styles you are hooked on for spring? Let me know if I missed any! Bejeweled,gold havaianas obeyed sandals in strong hues are exquisite to wear on formal events and occasions.